I am sharing this post in partnership with Simply Avocado. As always, all opinions are 100% my own. Thank you for the continued support of brands I work with, making it possible for me to continue creating quality content for you. Let Mom sleep in and then wake up to a delicious, restaurant-quality, avocado style, Mother’s Day breakfast in bed. If your Mom is anything like me, she will appreciate those extra winks and a thoughtful meal that pays homage to her love of avocados, with a surprise egg underneath. This gorgeous breakfast plate is easy enough for children of all ages to help prepare. First, let me say Happy Mother’s Day to all the mom’s out there! I’m honored to be on this journey of motherhood right along with you. Mom life is definitely one of the hardest, most rewarding and amazing experiences of a lifetime. It’s hard to imagine I’m sending my oldest off to college in the fall. As many of you know, the time flies, so enjoy every moment with your kids. One of my favorite things about Mother’s Day is that I get to choose what we’re eating! And what mom doesn’t love to have her favorites delivered to her in bed? I have always been a savory breakfast kind of gal. A good breakfast casserole or baked eggs have always ranked high on my breakfast bucket list. However, my love of everything avocado has really exploded over the years. Avocado has happily found a place in my breakfasts, desserts and it’s always a part of my snacking regimen. And there is nothing more delicious than enjoying avocado in its most pure and simple form. And now, thanks to a new line of pure, wholesome avocado dips and spreads from the makers of Wholly Guacamole, Mother’s Day breakfast in bed couldn’t be simpler to achieve. With SIMPLY AVOCADO™ there’s no need to wait or guess on the ripeness of an avocado. We’ve all been through that! Now it’s a breeze to enjoy a mess-free, always ripe and great-tasting avocado year round. As you can see, Simply Avocado is available in five delicious varieties – Sea Salt, Chunky Avocado, Jalapeno & Lime, Roasted Red Pepper and Garlic & Herb. You can find them in the produce department of select Walmart and Albertsons stores in the U.S. and online at Mexgrocer.com. As the brand grows its presence in produce departments both nationally and regionally, make sure to ask your produce manager when it’s coming to your local market. 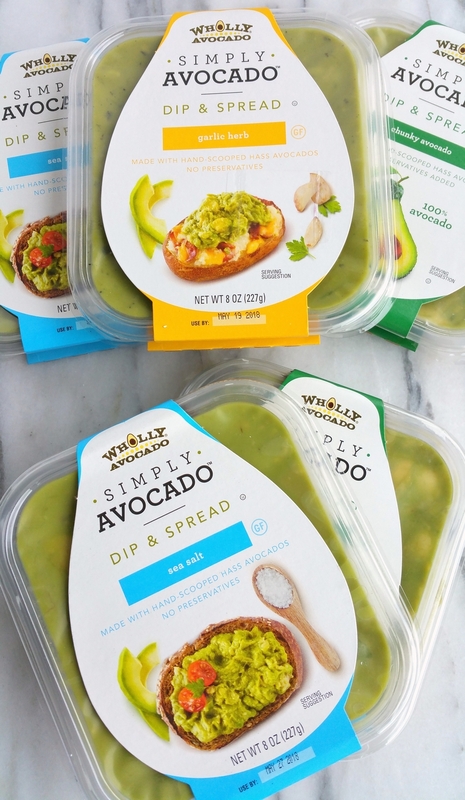 Simply Avocado is made from real, hand-scooped Hass avocados and each package has just four ingredients or less. You are going to love the big chunks of avocado you will find in every bite. 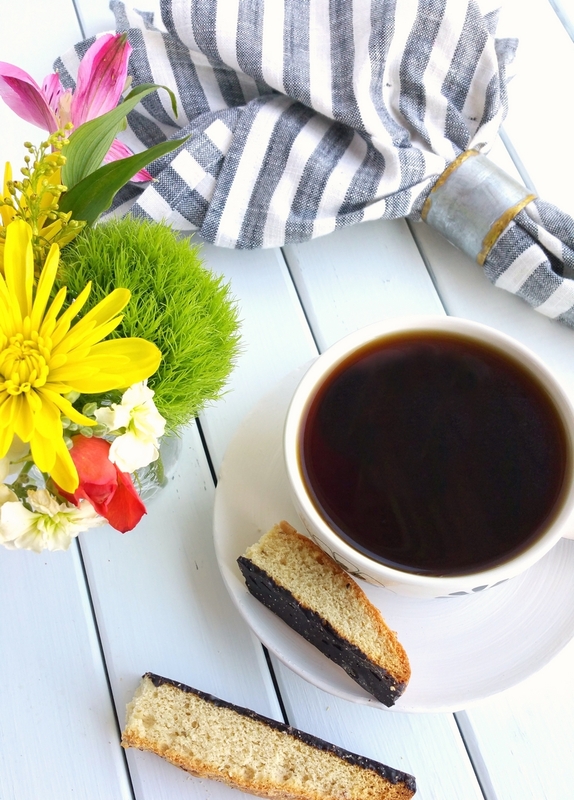 Before you begin preparing this recipe, make sure to start Mom off with a cup of coffee and sweet treat for dipping. Don’t forget a pile of magazines or a new book to entertain her while she waits is also a great way to start off her day of pampering. There are many aspects of this recipe that are perfect for the kids to help with. 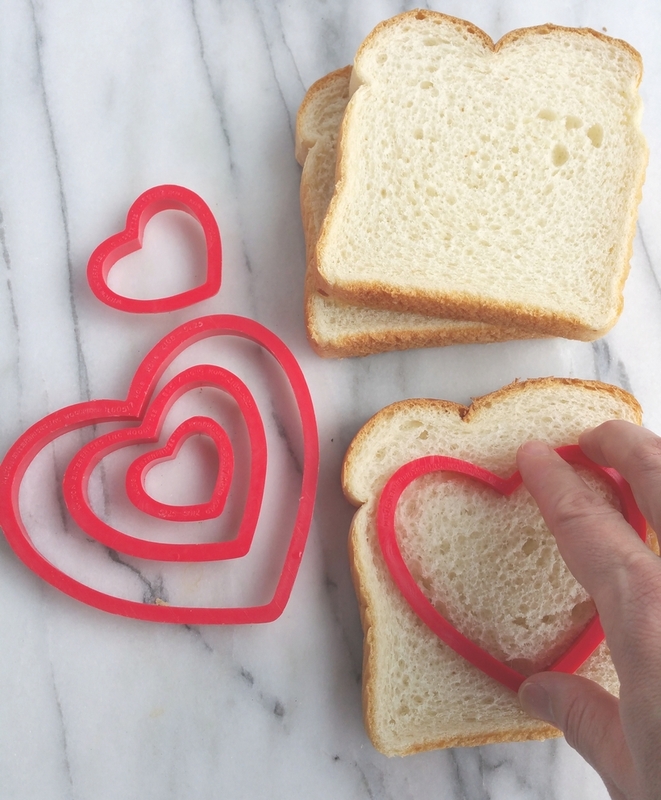 Let them start out by cutting plenty of heart-shaped dippers in sliced bread. 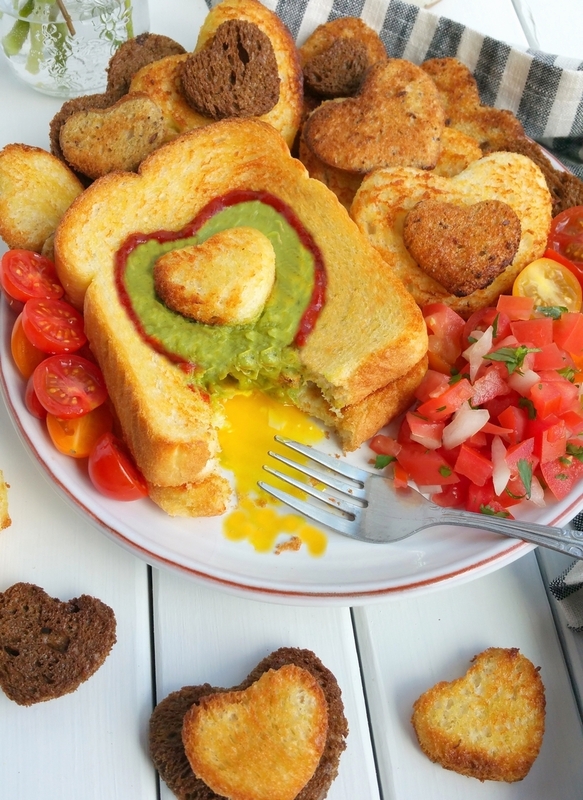 When it came time for choosing bread for my avocado filling and fried egg, I chose slices of Texas toast. If you’re not familiar with Texas toast it’s made from packaged bread that has been sliced at least double the average thickness of most other sliced breads. It’s available in almost every grocery store. The thickness allows enough room for the egg and for the maximum amount of avocado filling possible. As I mentioned, I used Texas toast specifically for the egg and avocado filling. However, for all the extra dippers, choose a few varieties of bread you know your Mom likes. I filled in with dark rye, honey chia and an Italian style bread loaf. Do not waste the bread that is leftover from the cutouts. Cut leftover pieces into cubes and place them in a freezer bag. Make homemade croutons at another time with your bread pieces. I do this with all my leftover bread pieces so nothing ever goes to waste. 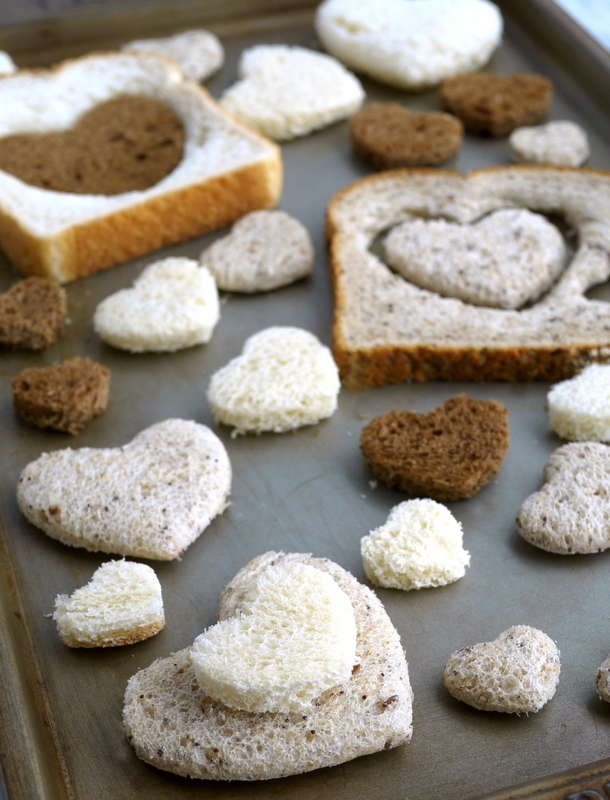 Have the kids brush each of these hearts with olive oil before toasting them in the oven. 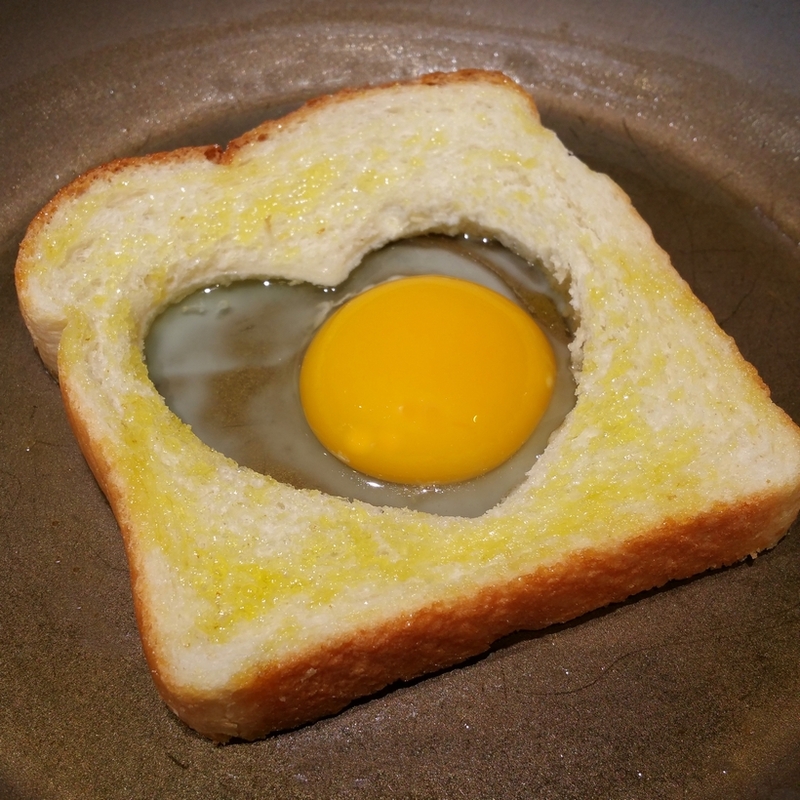 With a little bit of oil in a nonstick skillet and a little bit of oil dabbed onto your Texas toast bread, you are going to crack an egg right in the middle of the heart cutout. Depending on if Mom prefers a runny yolk or a more well done center will determine how long you cook your egg. 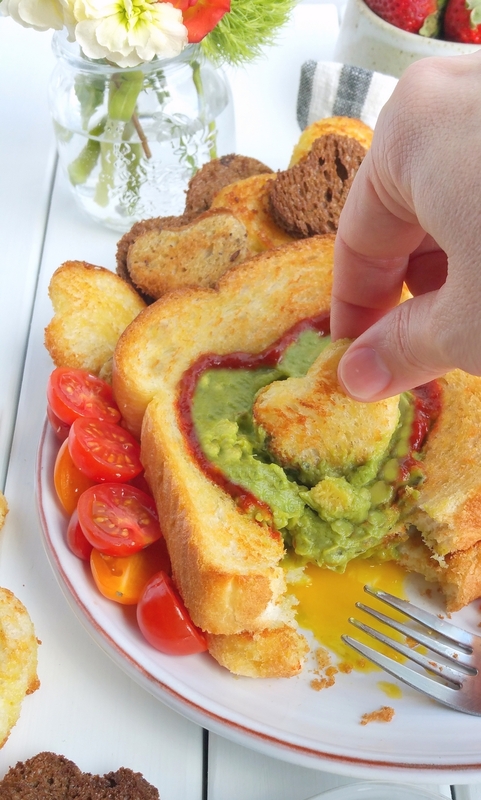 When Mom cuts into her toast, she will be pleasantly surprised there is an egg hiding underneath her Simply Avocado spread. Make sure you have lots of available dippers so Mom can scoop up every last bit of avocado and egg. What’s nice about the Simply Avocado packaging are these handy little trays it is packaged in that also includes a lid. When the rest of the family is ready to join Mom in bed, fill the tray with more dippers and let everyone dig in. I promise, Mom won’t mind the company of her biggest fans. 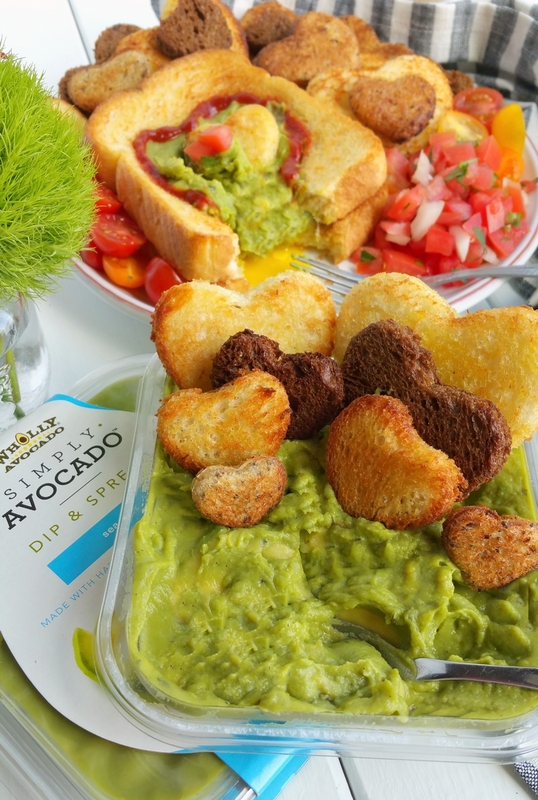 Let us know how much mom loved her Simply Avocado breakfast in bed! Are you in love with the idea of using Simply Avocado in as many recipes as possible? Here are a few ideas I know you’re also going to love. What could be easier than these Avocado and Skirt Steak Tostones? I know these Avocado and Pan Toasted Chickpea Pitas are going to happen in my kitchen this week. Avocado Breakfast Soft Tacos go along with my love of a good, hearty and savory morning meal. There is no better appetizer than a batch of these Easy Deviled Avocado Garlic Eggs. I’m not sure I’d be able to share these Avocado Filo Cups with anyone! Four years ago today I posted a recipe for Marionberry Swirl Coffee Cake with Cinnamon Whipped Cream. Have you made it yet? It’s worth trying. 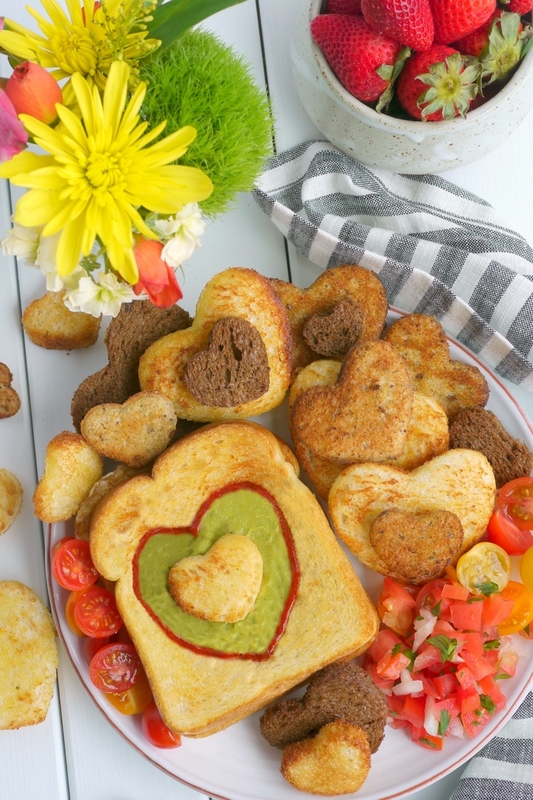 Start out by making two heart-shaped cutouts in each of your slices of Texas toast, using a heart-shaped cookie cutter approximately 3-1/2" wide. Continue making heart shapes with any other types of bread you choose. Make as many heart shaped dippers as you think you'll need. Place heart shapes on a baking tray. Brush each heart, front and back, lightly with olive oil. Bake for in the oven until golden brown, about 10-15 minutes. Brush cutout slices of Texas toast with olive oil. Add enough olive oil to coat a nonstick skillet over low heat. Lightly brown one slice of the Texas toast cutout bread on each side. Remove and set aside. Add a little more olive to the pan and place your second slice of Texas toast in the skillet. Carefully crack an egg into the heart-shaped cutout and season with salt and pepper to your liking. Let egg cook and set slightly for 2 minutes before carefully flipping over and cooking to your desired doneness; 2 minutes more for a runny egg yolk or 4 minutes more an intact egg yolk. When finished, place bread with the egg on your desired serving plate. Place second slice of toasted Texas toast on top so the two heart shapes match up. Fill the empty heart center with Simply Avocado Dip and Spread. (Smooth the top of the heart shape with the back of a small spoon.) Use your favorite hot sauce in a squeezable bottle to outline the heart shape around the Simply Avocado spread. Garnish the serving plate with the heart-shaped dippers made previously. Round out the meal with pico de gallo or sliced tomatoes if you choose. *I used Sriracha to make the heart shaped ring on top of the bread. It tends to be thicker than other hot sauce choices and already comes in a squeezable bottle. Refrigerating the Sriracha also helped its consistency and made it easier to draw the heart shape. Practice on a cutting board first so you know how quickly it will come out of the bottle. These bread and avocado looks so lovely and yummy. I just wanna bite it right now. Yep, it’s the perfect combination of yum! All of this looks wonderful. What a great idea for Mother’s Day. I LOVE AVOCADO!!! Thank you! I agree 100 percent!